I think I appeal to the escapism in people – the characters I play […] I like those characters myself; that’s why, maybe, I carry them to other extremes than my predecessors. […] a “Dirty Harry” character, a man who thinks on a very simple level and has very simple moral values, appeals to a great many people (1). Eastwood has tapped, perhaps, into the essential comedy of this post-modern age, in which we take all our pleasures knowingly. He allows audiences to indulge every wish-fulfilment fantasy of super-competent heroism without having to believe in the hero. Which is not to say that he is drained of positive value – just that his heroism is exercised as a self-conscious gesture, as if ‘doing right’ was somehow detached from personal virtue (3). In fact, Eastwood’s self-satirising of his Eastwood-as-Star persona coincided with the rise in popularity of the Hollywood action blockbuster and the later emergence of other, mostly younger action hero figures (e.g. Bruce Willis and Arnold Schwarzenegger in the mid to late 1980s). These new stars all used the Eastwood-as-Star persona as a template from which to fashion a seemingly more contemporary version of the male American hero (in reality, however, many of them seem more like parodies or at best, homages). Unlike his action genre contemporaries such as Charles Bronson, Eastwood seemed to have responded to this challenge as an actor/director by pursuing more independent projects that both acknowledged his acting oeuvre as well as his other off-screen (that is real-life) interests and social causes. Eastwood began to imbue his Eastwood-as-Star hero template with an increasingly “liberal” social awareness, helping us to further fuse Eastwood (the actual man) with Eastwood-as-Star. This has ultimately resulted in Eastwood-as-Star becoming a more three-dimensional figure who remains familiar yet chimerical, a ploy that has sustained a remarkably long career. Eastwood’s constant re-sketching of and playful ambivalence towards Eastwood-as-Star is brilliantly illustrated in The Outlaw Josey Wales (1976), his fifth feature as director (and fourth as actor/director). It is a film where Eastwood and Eastwood-as-Star is “scrambled and remade several times”(4), as he’s forced to rescue a never-ending series of social misfits and outcasts and keep them under his wing. From the film’s very first shot, Eastwood is rendered immortal (“good”) by the streaks of summer haze that set the scene aglow by the sun’s heavenly backlight. He’s seen ploughing a field with his son, notably referred to as “Little Josey” – a smaller, equally humble, noble, and physically similar, version of Eastwood himself. They are so similar they don’t even need to exchange words to communicate. The wordless relationship between Josey and Little Josey heightens the definite impression that the person we’ve been introduced to is not the vengeful/“bad” Eastwood-as-Star, but the wholesome Eastwood. Clearly, the mise en scène is telling us that what we are seeing is a storybook version not just of the pastoral West, but also of the legendary Eastwood. 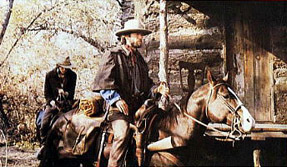 This opening idyll is quickly dashed by the thunderous hooves of the Kansas Red Legs; seeing a pall of smoke from the direction of his homestead, Eastwood happens upon a scene that physically and psychologically scars his character Josey for the rest of the film, that of his wife being raped and his son being burned alive. As he tries to intervene, he is struck down several times, finally reeling into unconsciousness after receiving a hefty sabre blow to the head. As he passes out, paralysed, his vision of the storybook land becomes nonsensical and wild. We hear his son, Little Josey (Eastwood’s own mirror of innocence and “goodness”), calling out to him as everything quickly fades to black. When he wakens, both his wife and son are dead. Surviving their death thus provides the impetus for Eastwood’s Incredible Hulk-like transition into Eastwood-as-Star. The next scene initially appears to be incredibly hammy; Eastwood falls over the makeshift cross he’s made to mark his family’s grave, sobbing with grief. However, upon repeated viewings of the film, this scene is more interesting and emotionally complex than it first appears. It begins with Eastwood hammering in the wooden cross with the back of a shovel and falling to his knees – partly in grief, admittedly – but also in obvious anger. As he drapes himself over the cross, crucifixion style, and then falls over with it into the dirt sobbing, it’s actually more accurate to read his actions as a literal blow-by-blow rejection of God, love and humanity in favour of the only alternative he knows – hell! This reading is further compounded by the fact that we next see Eastwood from various distances and camera angles as a silent, faceless, brooding, lone dark figure set against an increasingly imposing wilderness. He then joins Bloody Bill Anderson’s Missouri Raiders to “set things right” with the Union loving Red Legs. The film then proceeds to show Eastwood’s transition, through a montage sequence during the opening credits, to the Eastwood-as-Star persona. By the end of this sequence we see him as an unacknowledged and principled leader of the rabble who refuses to surrender his new lifestyle, choosing instead to become “the outlaw” Josey Wales. For the remainder of the film, Josey is forced to acknowledge the existence of his dual personas. He’s put in situations where he’s forced to acquire a new “family” by happenstance, such as his fellow outlaw’s massacre or Laura Lee’s (Sondra Locke) and Little Moonlight’s (Geraldine Keams) near-rapes. However, in scenes heralding a threat to Eastwood’s new family, flashes to visual and aural elements from the opening homestead raid and burial sequence are repeated as psychological echoes (acting as premonitions and flashbacks). The jarring quality of these signs of mourning, speak of Eastwood’s repressed rage, dread and reticence about his inevitable transition to Eastwood-as-Star. Notably, he always disappears briefly from the screen during his transformation, the effect of which is to both build audience expectation about the forthcoming violence that he commits and to signal that it is out of his control because it’s morally “just”. When he reappears however, just before he enters the fray, the mise en scène always describes him to the onlookers as an ambiguous presence. Set either into the recesses of deep shadow, with a carefully choreographed slash of light falling on just one intensely blue eye, or as a translucent apparition coming out of the sun, they’re never absolutely sure of which Eastwood he is. Hence the necessity of enlisting featured side-kick characters like Lone Wattie (Chief Dan George) who do the announcing for them (and us). For example, at one point he declares to Laura Lee: “Get ready little lady. Hell’s coming to breakfast!” And it is for precisely these indulgent moments that the older Eastwood films are significant, glorious, and more importantly, despite all their violence, fun. Eastwood as quoted in conversation with Patrick McGilligan, Focus on Film 25 (Summer-Autumn 1976), pp. 15–16. Amy Taubin, “An Upright Man”, Sight and Sound 3.9 (September 1993), p. 10. Richard Combs, “Shadowing the Hero”, Sight and Sound 2.10 (October 1992), p. 12.